In November 2006, only after three trials, Danny Major was convicted of assaulting drunk teenager Sean Rimmington at a police station in Leeds. 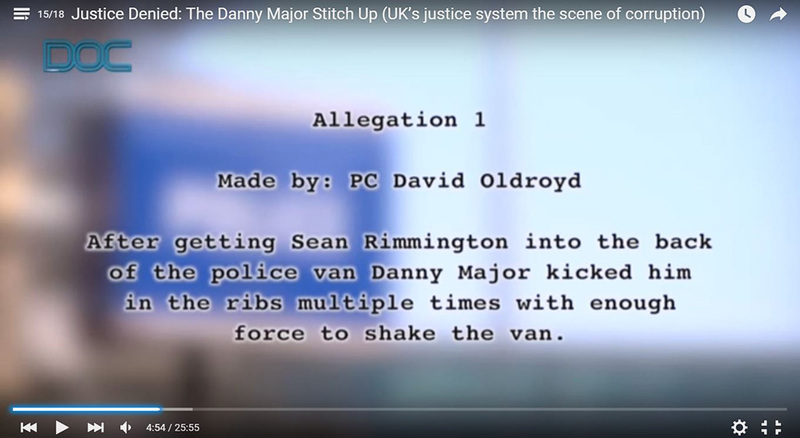 The only evidence was the word of fellow officers, as CCTV cameras were mysteriously ‘not working’ that night, basic procedures were not followed, custody documents were falsified and the custody suite was described as “a shambles” by the Judge. If you’re not familiar with the case, the unProfessional Standards website has a great write-up here. This documentary, presented by Michael Doherty of Justice NOW, features interviews with Danny and his family and runs through the major features of the case.